We've been getting quite a few fierce storms lately in my part of the world. The other day I drove through one of the worst wind/rain combos I've experienced in quite some time, although severe storms have been occurring more often here in the past few months. And below is the warning (archived here). Look at all that red. Read the sign. 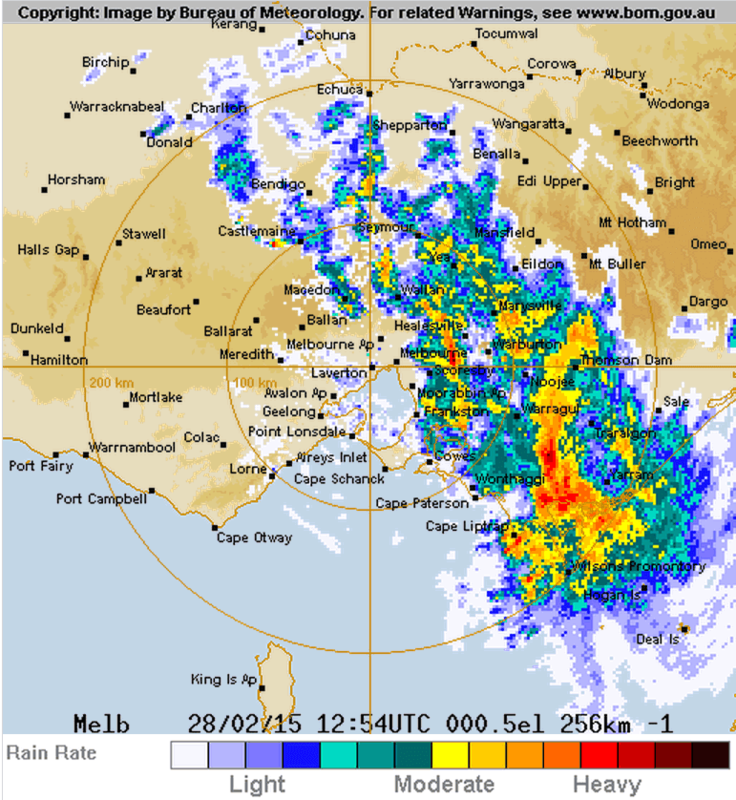 The Bureau reports that "Wind gusts to around 130 km/h have been reported with this storm front". Which is quite impressive. It rates up there with wind gusts in a Cat 2 Tropical Cyclone (which this isn't). 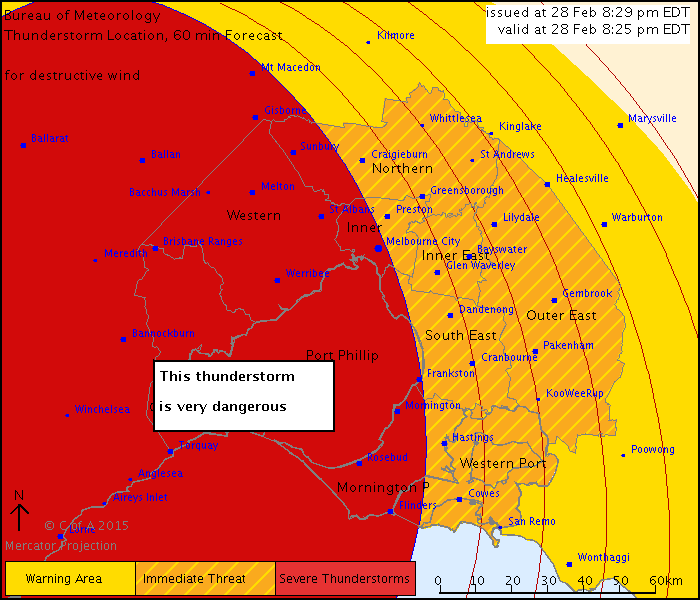 Usually severe thunderstorm warnings look more like this - yellow, not red. Which brings me to a paper that was recently been published in Science. It is by Frédéric Laliberté of the University of Toronto, and colleagues. The first time Anthony put up the press release, he linked to the paper. The second time he didn't bother. I don't think anyone at WUWT noticed that the article was recycled. Global warming is expected to intensify the hydrological cycle, but it might also make the atmosphere less energetic. Laliberté et al. modeled the atmosphere as a classical heat engine in order to evaluate how much energy it contains and how much work it can do (see the Perspective by Pauluis). They then used a global climate model to project how that might change as climate warms. Although the hydrological cycle may increase in intensity, it does so at the expense of its ability to do work, such as powering large-scale atmospheric circulation or fueling more very intense storms. The atmosphere's work as a heat engine occurs when an air mass near the surface takes up water through evaporation as it is warmed by the Sun and moves closer to the Equator. The warmer the air mass is, the more water it takes up. As it reaches the Equator, it begins to ascend through the atmosphere, eventually cooling as it radiates heat out into space. Cool air can hold less moisture than warm air, so as the air cools, condensation occurs, which releases heat. When enough heat is released, air begins to rise even further, pulling more air behind it producing a thunderstorm. The ultimate "output" of this atmospheric engine is the amount of heat and moisture that is redistributed between the Equator and the North and South Poles. ..."We came up with an improved technique to comprehensively describe how air masses change as they move from the Equator to the poles and back, which let us put a number on the energy efficiency of the atmospheric heat engine and measure its output," said Laliberte. The scientists concluded that the increase in water vapour was making the process less efficient by evaporating water into air that is not already saturated with water vapour. They showed that this inefficiency limited the strengthening of atmospheric circulation, though not in a uniform manner. Air masses that are able to reach the top of the atmosphere are strengthened, while those that can not are weakened. "Put more simply, powerful storms are strengthened at the expense of weaker storms," said Laliberte. "We believe atmospheric circulation will adapt to this less efficient form of heat transfer and we will see either fewer storms overall or at least a weakening of the most common, weaker storms." You can read the full article at ScienceDaily.com. So the end result, according to this work, is that as global warming continues, strong storms will get stronger and weak storms will get weaker. And maybe there will be fewer weak storms altogether. I confess I don't fully understand the reasoning. Maybe someone can explain it better in the comments. The paper itself has lots of equations and some diagrams that will undoubtedly be of interest to people who are better versed in the physics than I am. I thought it might be interesting to compare the comments on the two WUWT articles. Remember, the main thing that was different was the headline. The press releases were identical. As expected, some WUWTers didn't read beyond the headline. Here are some from the headline: "The end of Tabloid Climatology? Study says global warming won’t mean more stormy weather"
John was clearly responding to the headline, not the press release itself. AGW adherants won’t care. They tend to ignore anything contrary to their view. pokerguy did read beyond the headline to the press release. Didn’t have time to read the rest, but seems this statement can easily be interpreted…and will be interpreted by the alarmists, as consistent with their self-serving views on extreme weather. I don’t see why skeptics are celebrating. Tonyb didn't read beyond the headline, either. Well the theory sounds plausible and we have evidence of severe weather events during the lia from numerous records so I guess that’s settled then. So, rising temperatures due to increased co2 cause less severe weather events. How come that has seems to have evolved into rising temperatures from increased co2 Cause MORE severe weather events? There followed a very long discussion of car batteries for some odd reason. So let's shift up a month to the second article, which had this headline: "Global warming research: strong storms to become stronger, weak storms to become weaker"
And Global Neutral =? and Global Cooling =? And finally, “it is honestly too chaotic to measure or model” =? And yet they get paid, and furthermore are entrusted with training the young to become useful scientists by spouting this hyperbole? What about the reduction of temperature differential between poles and equators in a warmer world? That lessens the energy for storms. A cooler world is likely a stormier one. What about the lack of warming the last 15+ years? Why is it always assumed that the future will be warmer? They are working hard to link man-made CO2 to extreme weather, but it the dots do not connect, either in theory or in empirical fact. I have always thought that in a warming world, the atmospheric circulation would speed up and thus send more heat out to space, thus constraining the warming…that’s why we never had run-away warming. Obviously the increase in CO2 has reduced the amount of O2 getting to their brains. I can’t even count the number of thermodynamic laws this violates. I don't know if Ralph Kramden read beyond the headline or not. “while weak storms become weaker” This is good news, I hate those weak storms. Maybe they will become so weak we won’t know they’re there, like global warming. Based on brief (having exhausted my curiosity) analysis, no one noticed.